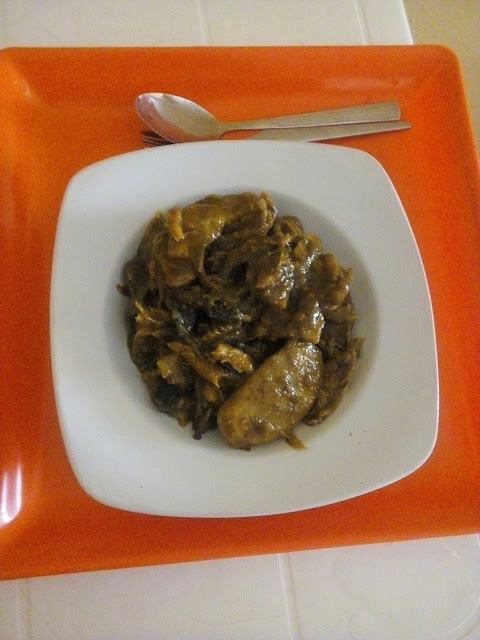 What's your take on unripe plantain pottage? Yummy 😋😋😋 or not? Do you know that unripe plantain is more healthy to ripe plantain and it contains lower calories??? I'll take us on the journey of how and when I discovered this recipe. About three years ago, my grandaunt decided she wanted to take an unripe plantain, in my mind, I was like ewww that who does unripe plantain? She prepared it and had it with vegetables. I had some and loved it. She explained the benefits to me and told me it's good for the aged ones. Plantain although a major source of carbohydrate, is a good source of potassium which helps our muscles function normally and regulates our heart beat. Enjoy this quick easy Nigerian meal. Peel the plantain and cut to desired shape in smaller pieces and place in a pot. Add the onion, pepper, salt, seasoning cubes, blended bell pepper and water and bring to boil. Soak dried fish in hot water. Add the crayfish, and leave to simmer for 5 minutes on lower heat. If the water is drying up, add 2 cooking spoons of water. Pour in the palm oil and stir. 0 Comment to "Unripe Plantain Pottage"